“The world in Brussels. Brussels in the world” is the theme of the 2015 edition of the Night of Knowledge on Brussels, on Friday, 27 November at the Kaaitheater. By means of short presentations and discussions, supported by scientific data, the evening will provide the opportunity to obtain information on and to debate about the different aspects of the internationalisation of the Region: insertion within advanced service networks, the informal economy, educational segregation, juvenile delinquency, contemporary art or the role of universities in welcoming refugees. Prior to this moment of exchange and reflection, Brussels Studies is publishing in its number 94, a short note in which Jean-Pierre Hermia (Brussels Institute for Statistics and Analysis) and Christian Vandermotten (Université Libre de Bruxelles) review two key factors: the characteristics of the presence of foreigners in the region and the place and the specificity of Brussels in relation to other major European cities. « Le monde dans Bruxelles. Bruxelles dans le monde » est le thème de l’édition 2015 de la Nuit du Savoir sur Bruxelles, le vendredi 27 novembre au Kaaitheater. Au travers de courtes présentations et discussions, cette soirée permet de s’informer et de débattre, données scientifiques à l’appui, sur différents aspects de l’internationalisation de la Région : l’insertion dans les réseaux des services avancés, l’économie informelle, la ségrégation scolaire, la délinquance des jeunes, l’art contemporain ou encore le rôle des universités dans l’accueil des réfugiés. En prélude à ce moment d’échange et de réflexion, Brussels Studies publie, avec son numéro 94, une courte note où Jean-Pierre Hermia (Institut Bruxellois de Statistique et d’Analyse) et Christian Vandermotten (Université libre de Bruxelles) font le point sur deux éléments clefs : les caractéristiques de la présence étrangère dans la Région ainsi que la place et la spécificité de Bruxelles parmi les grandes villes du continent. Als opstap naar dit moment van informatie-uitwisseling en reflectie, publiceert Brussels Studies een korte nota waarbij Jean-Pierre Hermia (Brussels Instituut voor Statistiek en Analyse) en Christian Vandermotten (Université Libre de Bruxelles) een stand van zaken geven voor twee essentiële elementen: de kenmerken van de buitenlandse aanwezigheid in het Gewest en de plaats en specificiteit van Brussel ten opzichte van andere grootsteden op het Europese continent. This number is published prior to the Night of knowledge on Brussels 2015, with the support of the Brussels Institute for Statistics and Analysis. 2Among these foreigners, the number of Europeans is increasing greatly and represents a significant proportion of the population (22.5% of the total population and 66% of foreigners). The number of French nationals and Mediterranean Europeans is increasing, but the most remarkable growth in 2014 was that of Bulgarian and in particular Romanian nationals, who now represent the third biggest foreign population in Brussels following the French and the Moroccans. 3But many people have acquired Belgian nationality throughout their lives2. 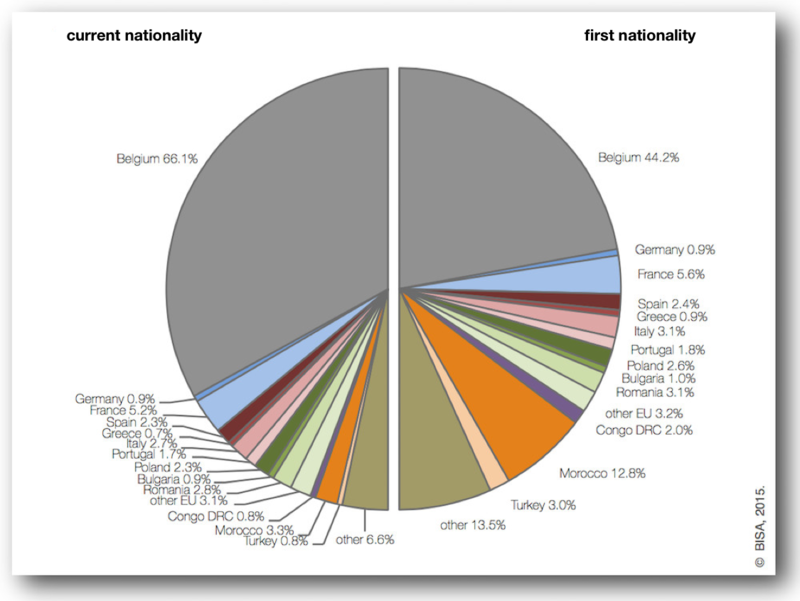 Previously unpublished information from the National Register concerning the first nationality registered in this administrative database allows insight as regards the nationality at birth in addition to the current nationality. On 1 January 2015, there were 655 450 people in the Region – i.e. 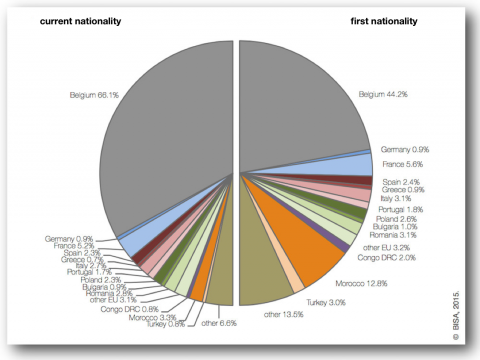 55.8% of the population – whose first nationality was not Belgian. The proportion of people whose first nationality is foreign has been increasing steadily in recent years, amounting to 41.3% in 2000. This population counts a large amount of Congolese, Turks and above all, Moroccans. These have a strong tendency to acquire Belgian nationality, more often than the European Union nationals. The people with Belgian nationality and another nationality are considered as Belgians. 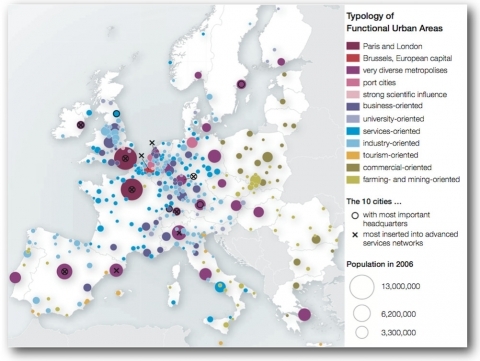 The comparison illustrates that, in this case, the notion of foreigner is purely administrative: a foreigner (at time t) is an individual who is not a Belgian national at time t.
4The diversification of the (foreign) population of Brussels is explained in particular by the fact that – despite its modest size – Brussels is a global city. 5It plays a major role in globalised networks, which implies an economy driven by an administrative and high-productivity services sector. The presence of international institutions in Brussels has a direct and induced impact on approximately 15% of the Region’s GNP. 6But Brussels is an atypical global city, comparable only to Washington: its position is very strong at political level, but more modest as regards steering the global economy3. 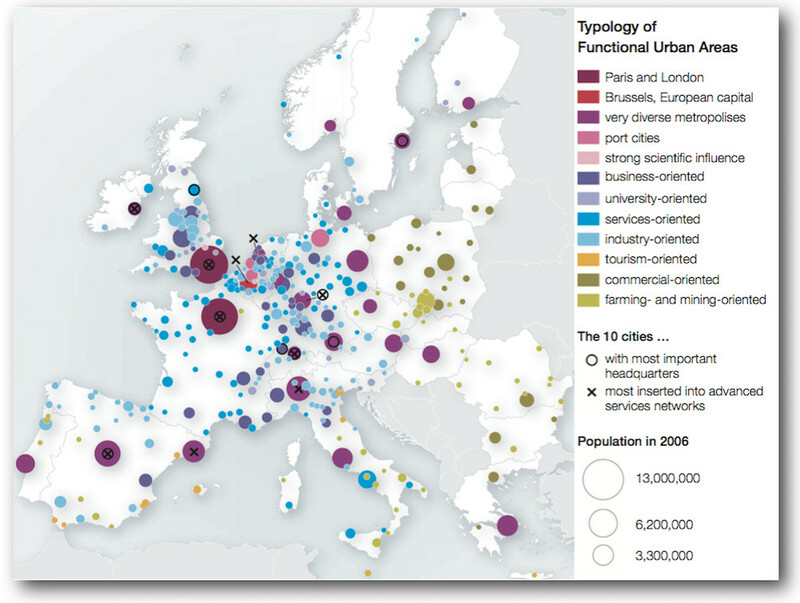 It is not one of the ten most important European cities in terms of the location of head offices. In reality, it would be included at metropolitan rather than regional level if Leuven was added, with the head offices of INBEV. This also leads to a relatively modest position in terms of research and development, notwithstanding the importance of basic research which is conducted in Brussels: due to its strategic character, the location of research and development (R&D) is very close to the head offices. Once again, the position of Brussels improves in this respect if Walloon Brabant is included, where R&D is driven by the importance of the pharmaceutical sector. 7In contrast, advanced services have a strong presence in Brussels, acting as the interface between economic management and political leadership, with all that it implies in terms of the presence of lobbyists, embassies, etc. 8These characteristics of the Brussels economy ensure satisfying and stable growth for the Region, but the other side of the coin is relatively low employment creation, in particular low-skilled jobs. This results in one of the bases for the difficulties faced by the Region, exacerbated by the narrowness of its territorial framework: Brussels creates wealth, but it is redistributed above all in its employment area and the rest of the country. The Region itself has a high unemployment rate, with a population whose income is now significantly lower than the Belgian average, and even lower than the average income per inhabitant in Wallonia. The city has a thriving economy (generating approximately 20% of the GNP) as well as a high level of poverty (its inhabitants dispose of only 8.5% of the national tax revenue). 2 MYRIA, 2015. Migration en droits et en chiffres 2015. Bruxelles, http://www.myria.be/fr/publications/la-migration-en-chiffres-et-en-droits-2015.